This “record” will show where I got poison ivy this time!!!! Since I began beekeeping I have taken records in several different ways. Initially I used a form downloaded from the internet that was like performing a physical every time I opened the hive. I gathered a lot of information as numerical values and yes/no check-boxes. When I went back through to review a lot of that information was not nearly as useful as what I had written in my “Notes” section. 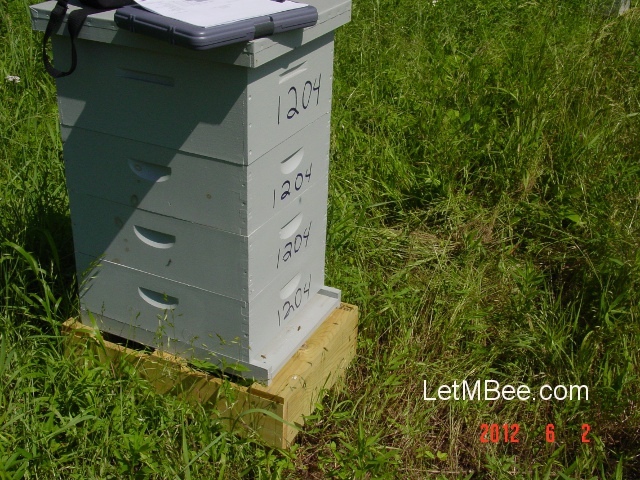 “Notes” include activity at the entrance, comparison of activity between hives at the site, and in general a list of observations of the day. I have found it easier to remember the experience of the hive inspection through this type of record keeping rather than a check off form. 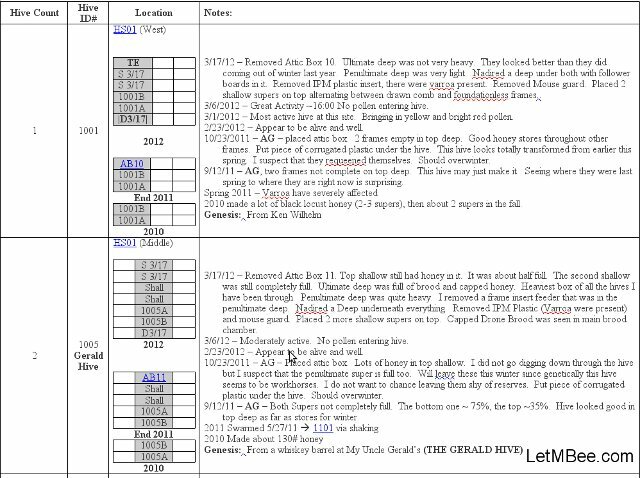 After a while I began to use a comp book focusing on observations as my record keeping system. I like to represent things visually as much as possible. The comp book method made it easy for me to do some of this initially. As time went on though it became harder and harder to find what I was looking for in the comp book. I wrote in page numbers and tried to keep up a table of contents, but things just got out of hand. I had to think of something more user friendly. I decided to try to use the computer for some of my record keeping. Note the room at the top to add more hand written information. Also all hyperlinks are underlined. I currently use a Word document as my primary form of record keeping for several reasons. First it is easy to modify. No need for a TOC when you can just go in and insert text right where it is needed. Another useful function is the use of bookmarks and hyper links within the document. If I take note that the Genesis of this hive was from Trap03 I can just click on it and I’m taken to the accounts of Trap03 for that year. I normally print out the document about once a month. I then fill in any new documentation with pencil while out working the bees. I then manually enter the observations into the computer. The extra step is tedious, but it makes me revisit and rethink some of my observations. The camera can recall things you won’t be able to. My clipboard and paper are atop 1204. Take your camera along. The reason you are keeping these records is to recall what happened in the past. Visual reminders will take you back and may allow you to catch things you otherwise might miss. Last year I had several swarms come right to the house. While reading beesource a comment in a thread caught my eye. One person said something about increasing trapping rate by having a Solar wax-melter near your swarm traps. Amazingly I had dated pictures showing my melter in use when all those traps were occupied. I don’t think everyone needs to document their records in the same fashion. Whatever you decide on make sure you are looking at big picture issues rather than just numerical values and check-boxes. What do you think? How do you keep track of your hives? 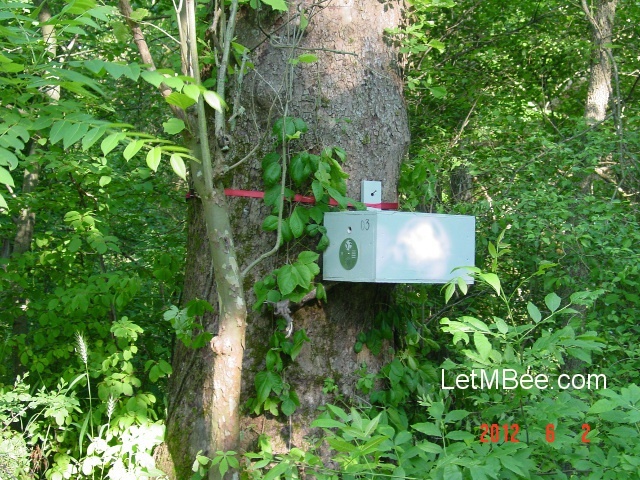 This entry was posted in HowTo, Posts and tagged bee, beekeeping, Indiana beekepeing, Jason Bruns. Bookmark the permalink. Great post! Pictures are so important during inspections. They act as an unbiased second set of eyes. Sometimes I see things in pictures I fail to notice during the inspection itself. Of course blogging about it helps too. Blogging about it does make you pay closer attention. Half the time I am thinking… “I can’t screw this up because I will then have to tell everyone….. I screwed it up!! !” 🙂 It makes me think about things a little more before I do them. The video camera can teach you some wicked little secrets about how you do hive inspects. I couldn’t believe how bad I was. It made me a better beekeeper. Wow you are a very organized record keeper, my records consist of a journal entry’s, listing what I think is important about each hive, simple but hard to revisit since I have to roam through a lot of dates, I’m to lazy to keep more detailed records though. I do try to write down when important plants bloom such as clover and dandelions ect. What hive swarmed, when pollen starts going into a formerly queenless hive ect. Not as organized as I should be. I forget to write a lot down. There is a guy that was at a bee association meeting that has been keeping bloom and weather data for 20 years. He is fascinating to talk to. There is always going to be something we need to improve on as beekeepers. Record keeping is just one of those things….. It really doesn’t matter how you keep records or what records you keep. Everyone is going to have a different idea as to what is important. If your bees are doing well you are doing something right. I still use the ‘ole paper and pen method. I have tried to bring it all out in the apiary, but it is hard to write with gloves. I usually have to force myself to remember what we did. I have taken to bringing the camera out too for my blog. I too have had to refer to my blog to remember certain details. I agree. Camera and vidoe are life savers for me. I am thinking about my bees more this year since I am trying to keep up on this blog. It is really helping with the record keeping. Just writing about things is a huge help in keeping things straight in my head.